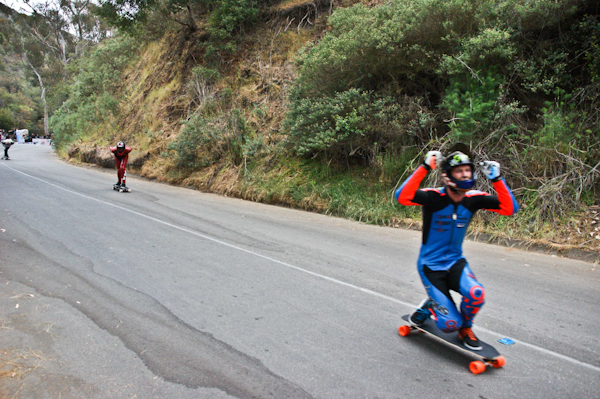 Pat Schep, living the downhill dream on Catalina Island. Photo: Bandy. 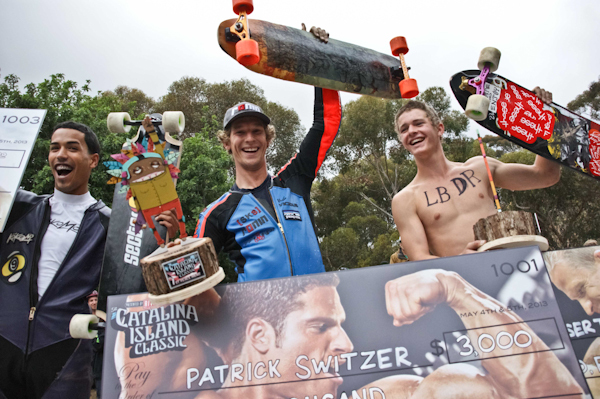 The 2nd annual Catalina Island Classic went down in style this year. 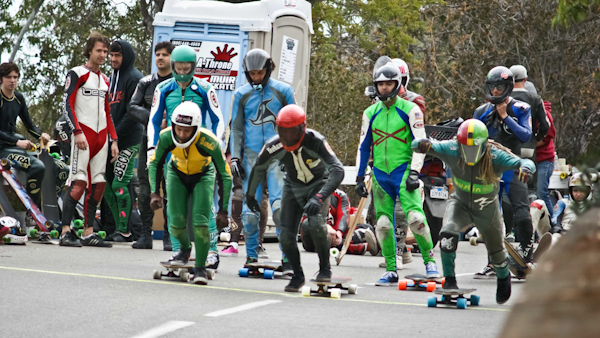 The racecourse was winding & technical, the event organization was stellar, and this time around the skaters were allowed two days of shredding on the hill rather than only one. Insert a smile here. Tall and panoramic peaks surround us as we float into the colorful and inviting Avalon Bay. Crowds of yachts, smiling sunglasses, a relaxing sand beach straight ahead, and colorful bungalows lounging on the hillsides greet us with a subtle wink as we arrive. 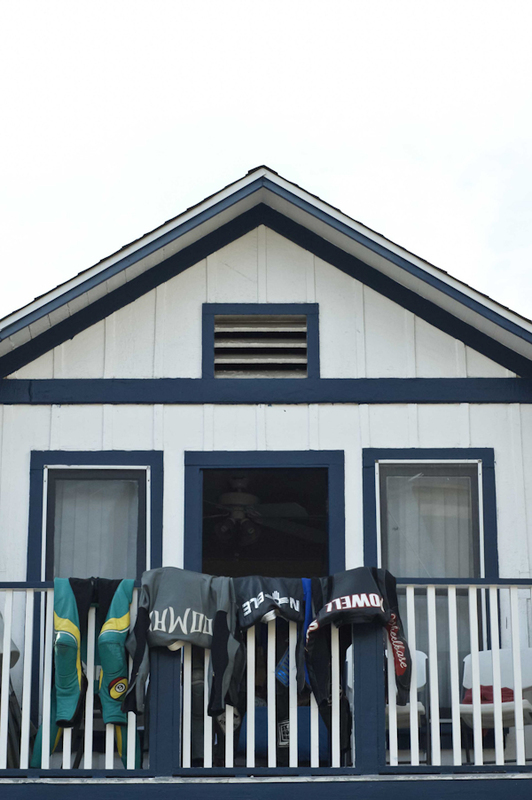 Wide-eyed and via a packed charter boat we land, gather our belongings, and hop onto the majestic Catalina Island. Inspired, excited, and ready for whatever what may. Stoked! And they’re off. . . Photo: Ruano. Royce with the look-back. Photo: Ruano. Spencer Smith out front and in the zone. Photo: Bandy. Corners on corners on corners. Photo: Bandy. Daniel Luna, speedy. Photo: Ruano. Scott “El Beasto” Lembach. Photo: Ruano. Tyler Howell and El Beasto fighting for that inside line. Photo: Bandy. Liam greasin’ through the shadows. Photo: Ruano. Byron Essert is always fast, always stylin’. Photo: Ruano. Amanda Powell, shredding. Photo: Ruano. 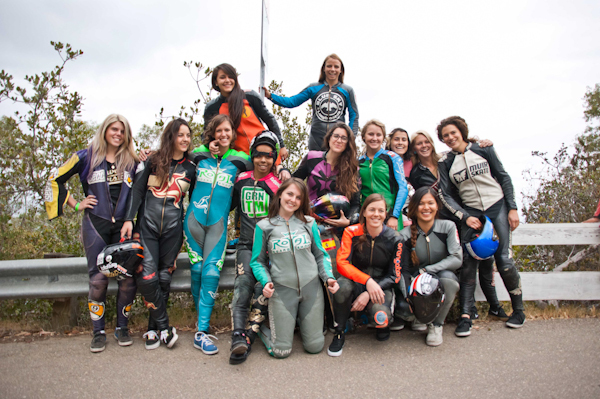 The ladies of the Catalina Island Classic. Stoked!! Photo: Ruano. Sara Paulshock, charging it. Photo: Ruano. 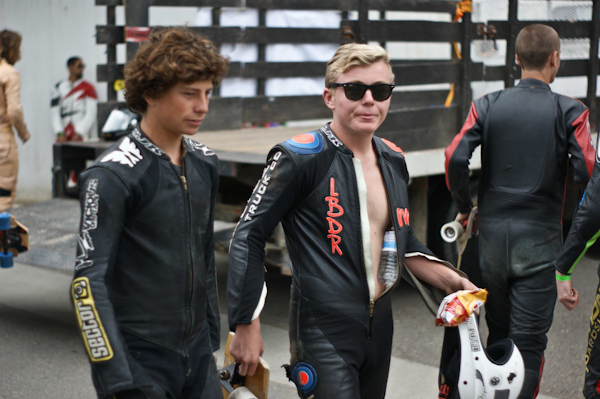 The first day of this year’s Catalina Island Classic was set aside for freeriding and general practice for Sunday’s race. The sun shone warm and bright all day long, and although the riding was a bit slow early on as riders gathered there bearings and became comfortable with the whipping and winding of Wrigley Road, after lunch the speeds were up and the best lines had been found and dialed in. George Mackenzie, Patrick Switzer, Scott Lembach, Tamara Prader, and Amanda Powell (among others) looked fast and confident as day one of the event drew to a close. After the day’s skating was finished, many of us walked back to our bungalows with our heads and mouths replete with speculation as to who might win this year’s race. But that’s all it was: idle speculation. The race was not until the following day and we still had a full night to roam the island and catch up with old friends. Day-one completed. Leathers off—time for some island-style R&R. Photo: Ruano. “Sometimes you eat the bar, sometimes the bar eats you.” Vegas Mike, paying to play. Photo: Ruano. Cameron Frazier, up early and finding paradise. Photo: Bandy. 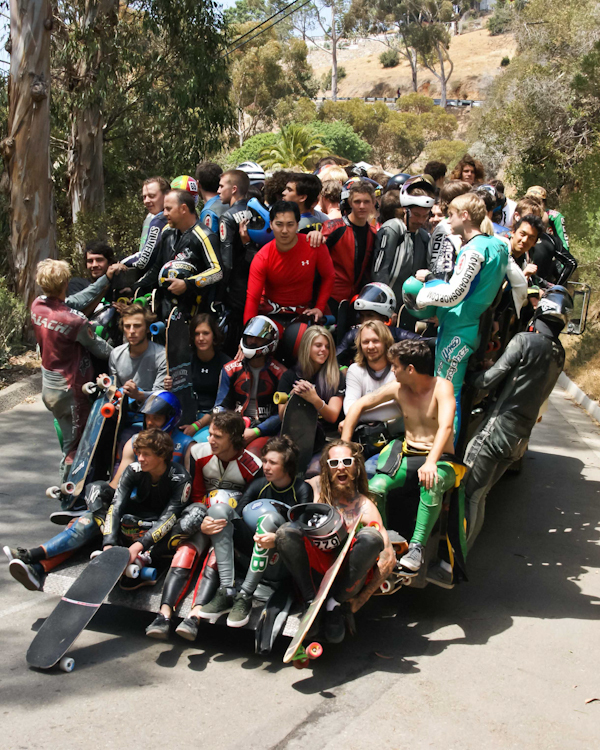 How many skaters can you fit in a truck? This many! Photo: Ruano. Let the racing begin. Photo: Ruano. Oh, the views! Photo: Ruano. Into corner one with momentum! Photo: Ruano. 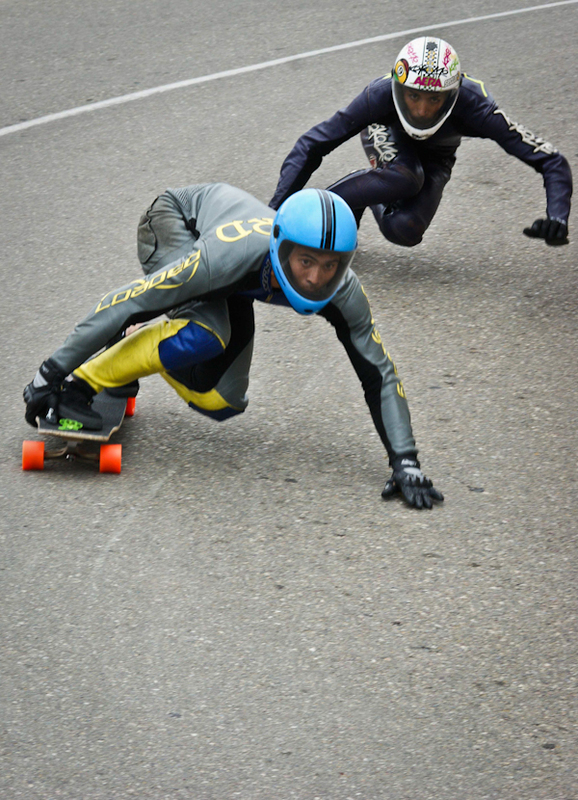 Trevor Baird railing it with Jomar in tow. Photo: Ruano. Switzer looking fast early on. Photo: Ruano. Sunday—race day. Practice began promptly at 9am. 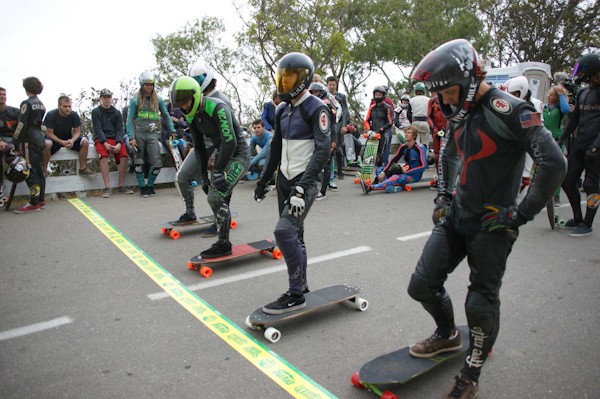 It became clear early on that a contingent of racers stayed up late the previous night lurking hard with the homies and getting a bit rowdy. Such is life. Ha ha! As the day progressed and the racing brackets began to narrow and shrink, it was obvious who wanted to win this year’s Catalina Island Classic and who was there to win the party. 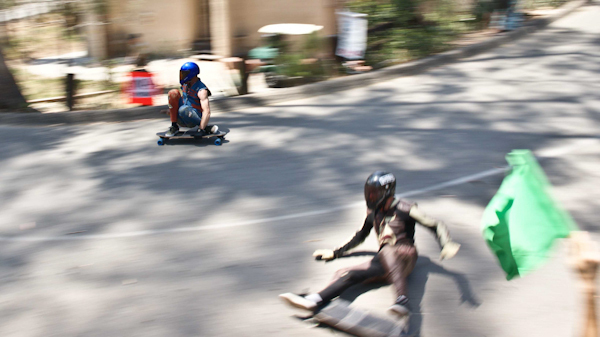 Both the Men’s and Women’s Divisions were stacked with badass racers from all over the planet. The women’s division was especially impressive this year due to the fact that the number of women racers doubled over last year. Very stoked! The racing in general was solid all day, and across the board. 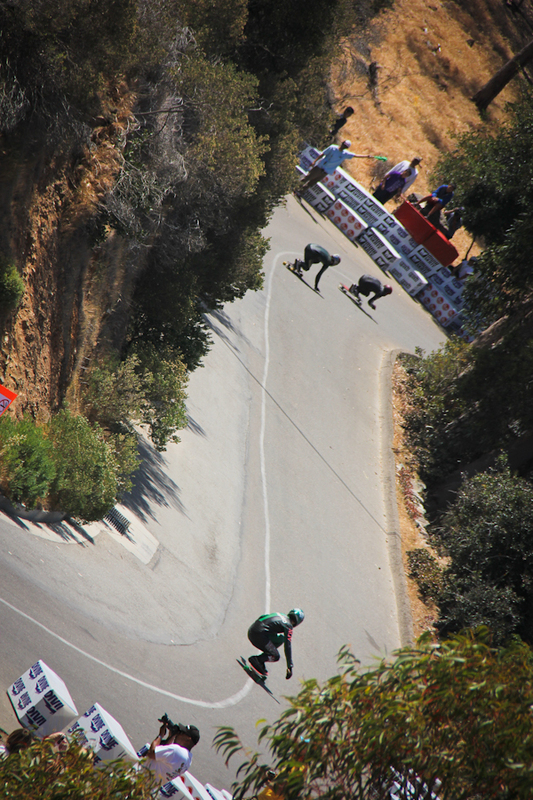 There were a number of corner crashes, tight packs speeded down the winding road all day long, and sketchy passes were not a rare occurrence. In the end, the fastest and most focused skaters landed on podium. Congratulations homies!!! With eyes of tigers! Azuro, Zen, and Andrew all in the zone. Photo: Ruano. Cooper “Frantasty”, stylin a picture-perfecto, hand-down toesider. Photo: Ruano. 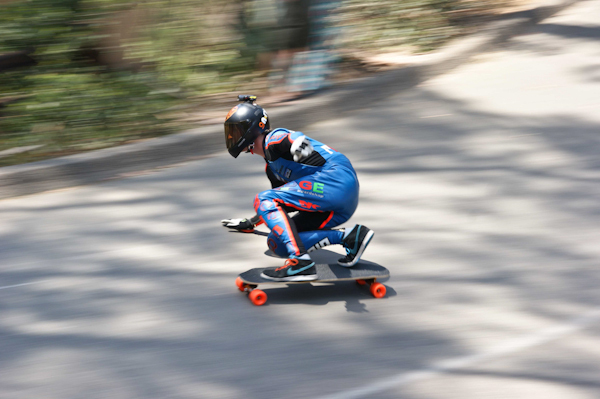 Sector 9’s Jeff Budro leading by example. A true OG! Photo: Ruano. Patrick still out front in the semis. Photo: Ruano. Levi “purple” Green, putting on a fresh set for his next heat. Photo: Ruano. 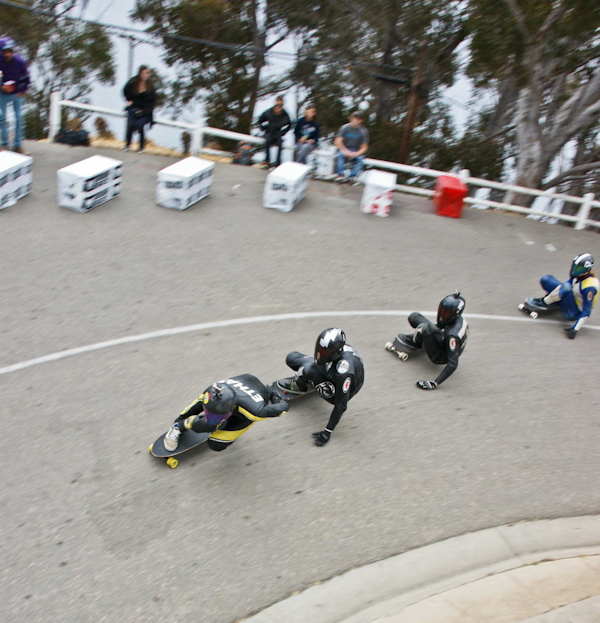 Tucking, then corner two. Photo: Ruano. Laguna groms, grom-gromming. Photo: Ruano. Hugh takes a boss line, sans sleeves. The competition did neither of those things. Photo: Ruano. And there ya have it!!! P-Swiss wins the Second Annual CIC! Photo: Ruano. A spectrum of emotions. Photo: Ruano. The ladies celebrating an awesome Women’s Finals. Photo: Ruano. 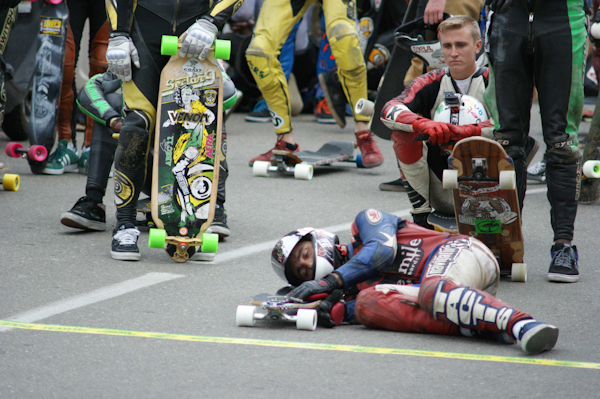 A very special thanks to all the event sponsors: Riviera Skateboards, Paris Trucks, Divine Wheels, Muir Skate, CSC, Abec 11, Sector 9, and Pabst Blue Ribbon. A special thanks to the Avalon Fire Dept., Public Works, City Council, and the Chamber of Commerce. 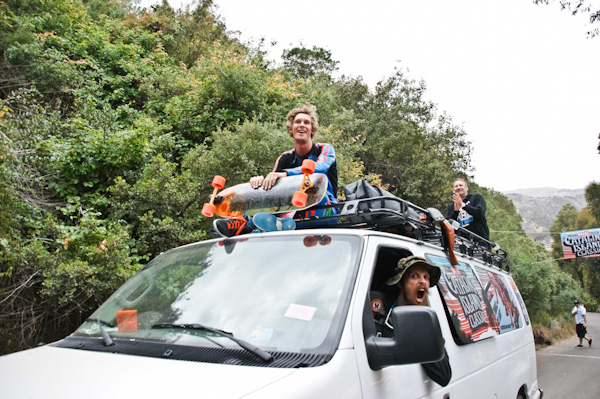 A hardy high-five to all the volunteers that put in their time and effort to make the event a reality and run smoothly, to Connor Welles and the Road Rider crew for letting Wheelbase Magazine lurk hard in your condo and for the hospitality in general. Thanks to David Ruano for shooting great photos, to the Resource Dist. homeis for letting our editor MC the event—and a ten-gallon hat tip to Justin Reynolds and Dubes for handling biz and for putting all the hard work and dedication necessary to make it all happen with style. Good times. Appreciated! And lastly, but not at all least, a huge thank you goes out to all the local residents of Catalina Island for their hospitality and for putting up with us. We love you Catalina Island! See you all next year at the 3rd annual Catalina Island Classic! 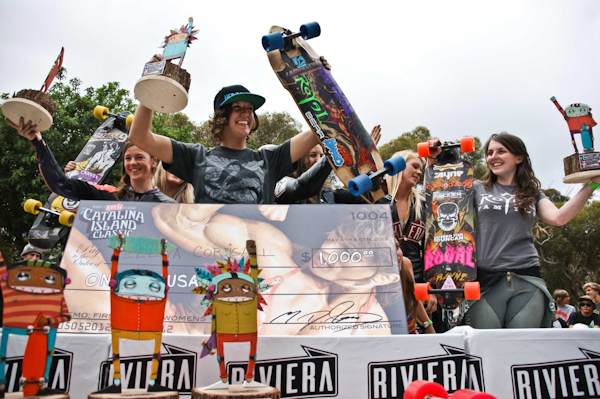 2013 Catalina Island Classic Promo – Riviera Skateboards The Catalina Island Classic: A California Comeback Video: Riviera Skateboards “Another Look At ‘The Catalina Island Classic'” Riviera Skateboards Presents The 2012 “Catalina Island Classic”, May 5 & 6. 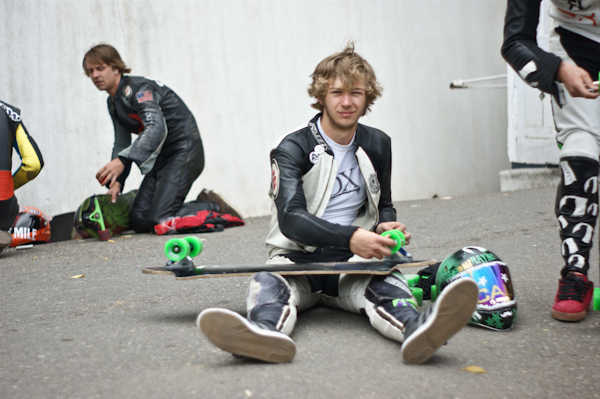 Killing it with the photo stories again Wheelbase. Some epic shots as always! Thanks homie. We wish Les was there! See you in Canada real soon! Yeah Buddy!